Hi there. I’m still trying to wrap my head around the fact that Halloween is next Monday! I have always loved Halloween and when we lived in Orange County it was particularly fun because we lived in a neighborhood full of kids. 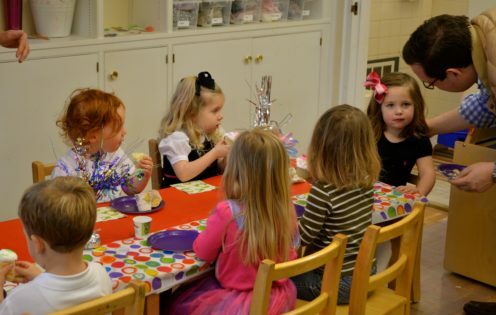 Everyone went all out decorating their homes and yards, and it was a fun & festive time for all, including the adults. The kids would go door-to-door collecting treats, while the grownups would share adult beverages and conversation along the way. Now we live in a community where most of the kids are grown and have their own homes elsewhere, including my oldest son who resides in DC with his family. Gone are the days when I used to prepare Halloween treats for my kid’s classrooms, sending them off to school with something fun to share with their classmates. But now I have 2 grandbabies, both of whom attend preschool, so this year I decided to prepare Halloween treats for them to share with their classmates. And today I’m sharing a DIY idea for special Halloween treats with you too! 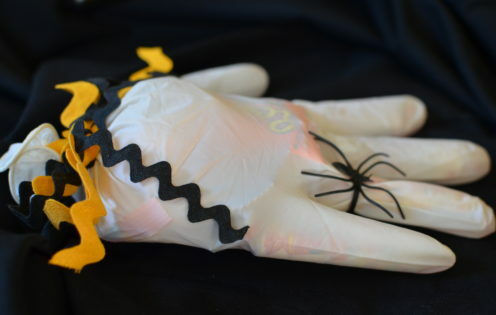 They are Surgical Glove Goodie Bags! 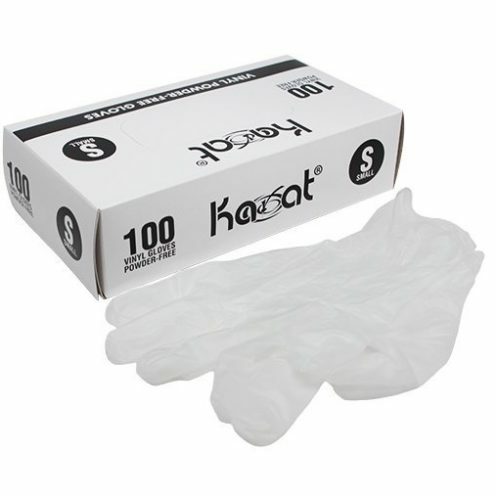 Purchase a box of opaque, powder-free, non-latex gloves. I got mine here. I like the more opaque gloves because the contents won’t show through as much. 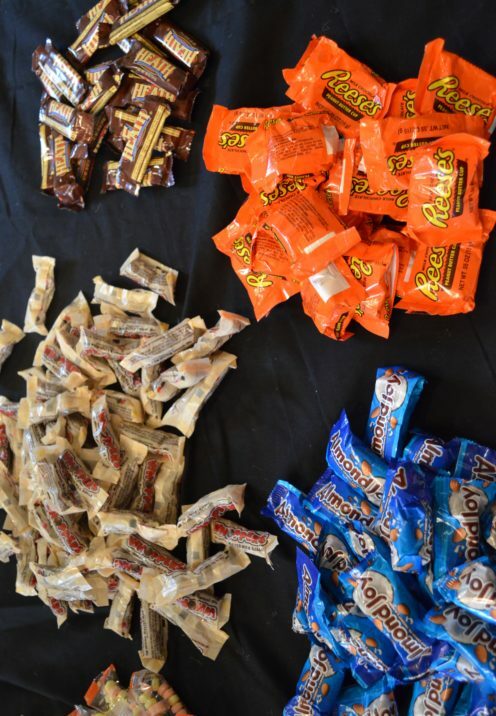 I then bought bags of assorted packaged candy with wrappers, it’s more sterile this way. I separated them into like groups so that I could fill each glove with the same type and same amount of treats. Oh, and I suggest buying candy you don’t like, otherwise it’s very tempting to sneak a treat for yourself. I made the big mistake of buying the kind of candy I like! 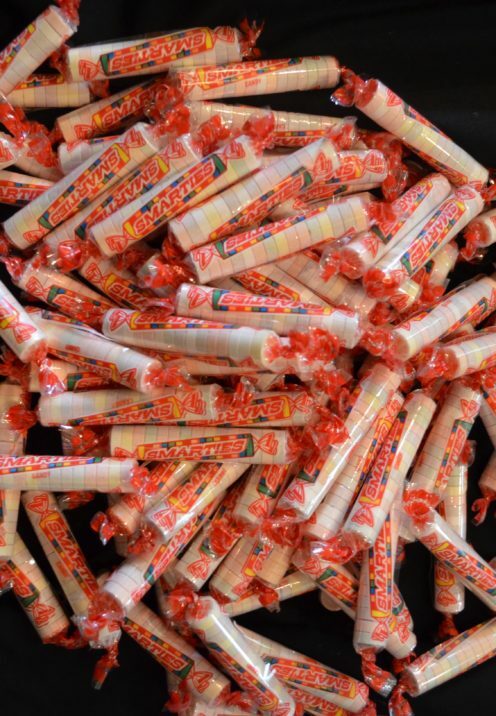 You’ll also need a large quantity of Smarties. That’s because you’ll use 5 in each glove to fill up the fingers. 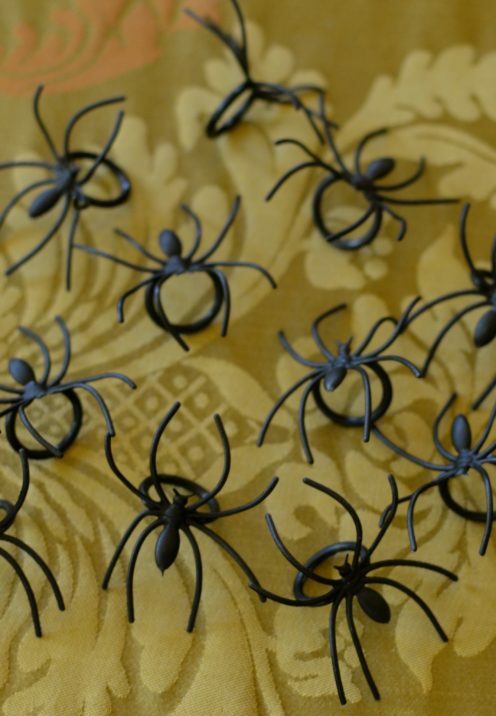 What makes these Halloween treat bags extra special is the addition of a spider ring. I got mine here. They come in a pack of 36 rings. You’ll also need some ribbon to tie off the ends. In my case I used black and yellow rick-rack. 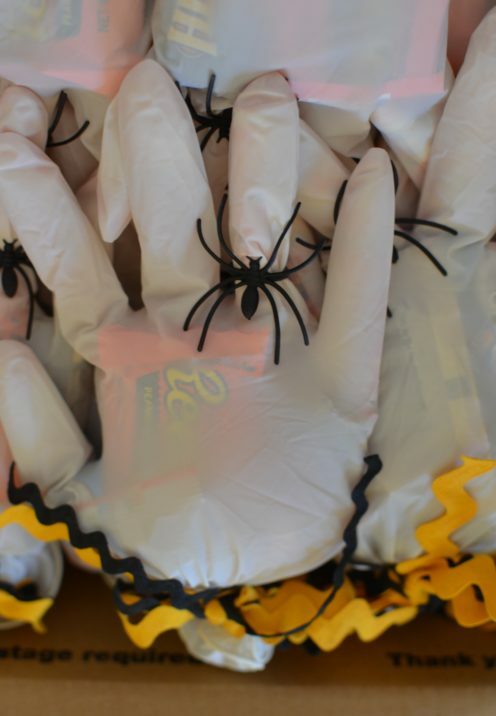 Simply fill the fingers with the Smarties and then plump up the hand part of the glove with the assorted candies, putting the same type and quantity in each glove. 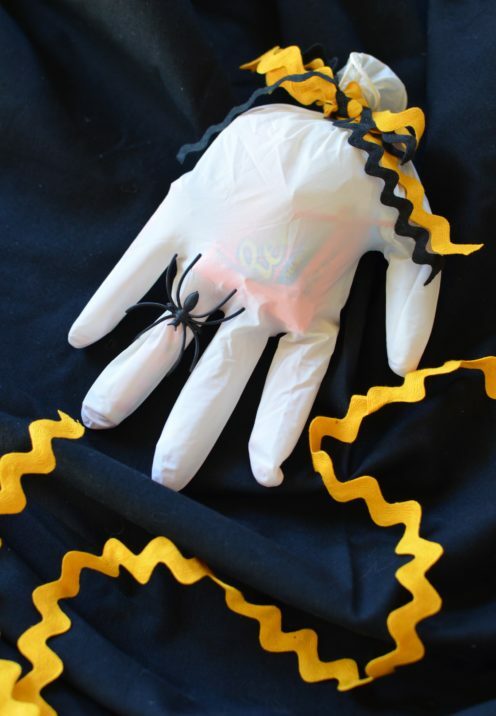 Tie off the ends and add a plastic spider ring and voila, you have yourself a clever Halloween treat bag that kids will love. 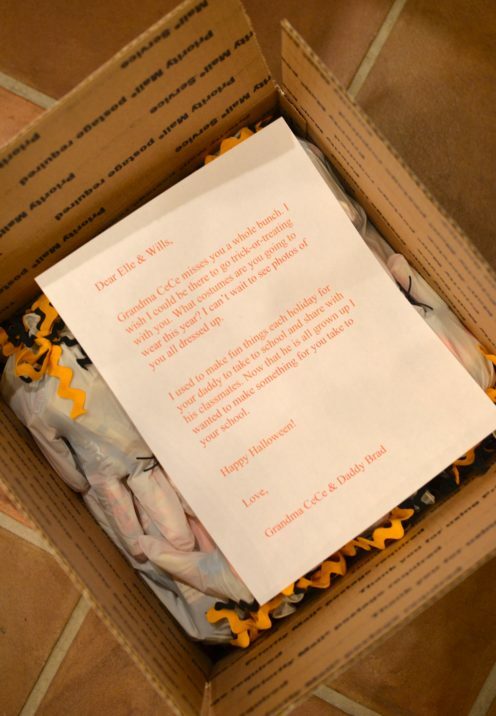 I then got myself a shipping box and filled it with enough candy-filled gloves for all the children in my Grandkids classrooms. I added a little note and shipped them off to arrive just in time for Halloween. 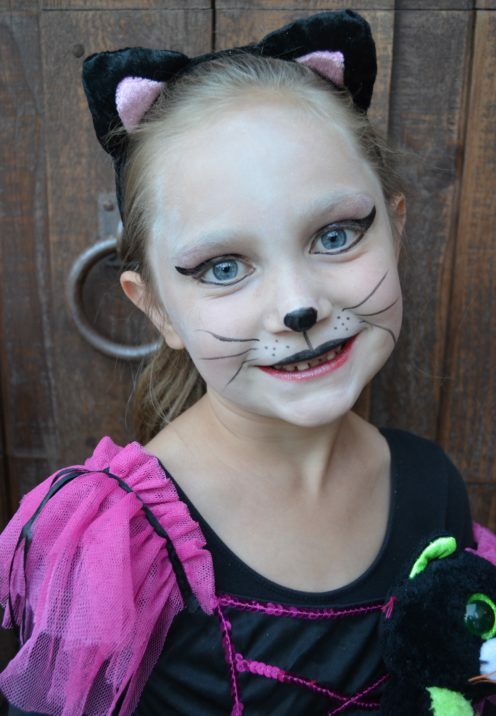 I’m so sad I won’t be there to Trick-Or-Treat with my Grandbabies this year! 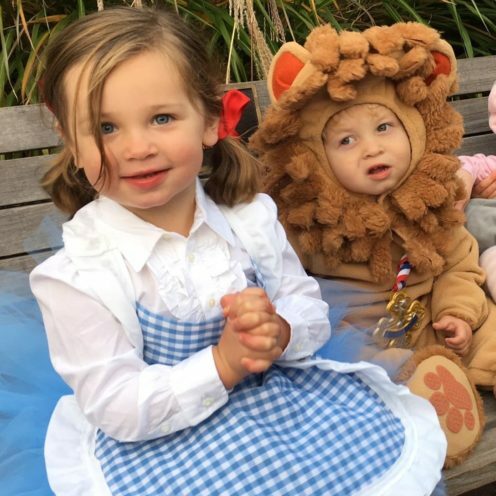 Last year they were characters from The Wizard of Oz. 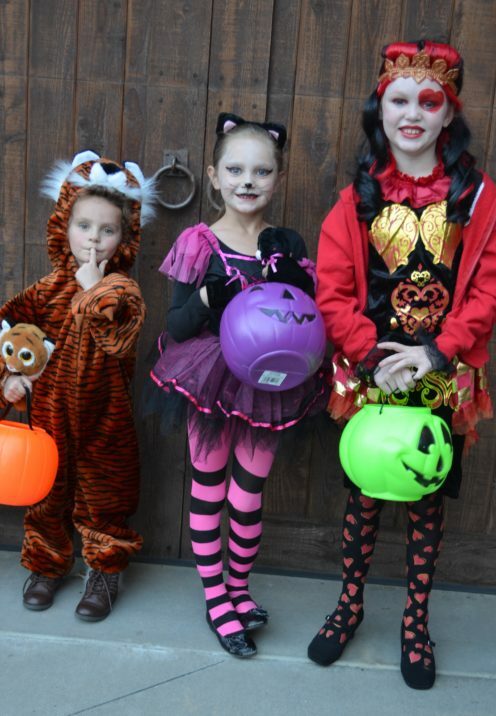 I can’t wait to see photos of them in their costumes this year! While we don’t get many Trick-Or-Treaters in our neighborhood here in Lake Arrowhead, I’m always prepared for the arrival of the kids who live across the street. 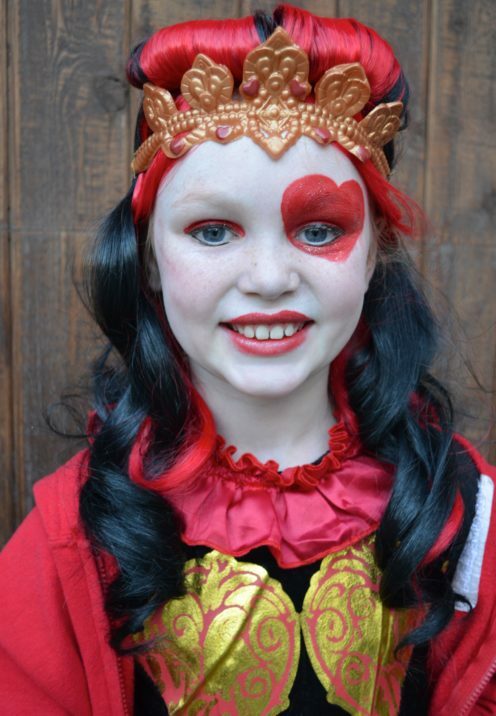 Last year their mom did a magnificent job of dressing them up! I can’t wait to see them this year! 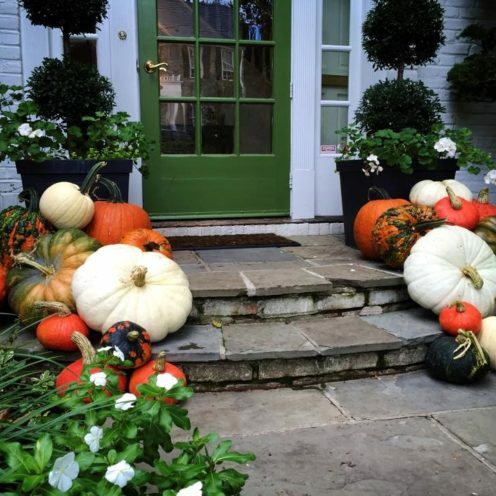 Wishing you a lovely Halloween! 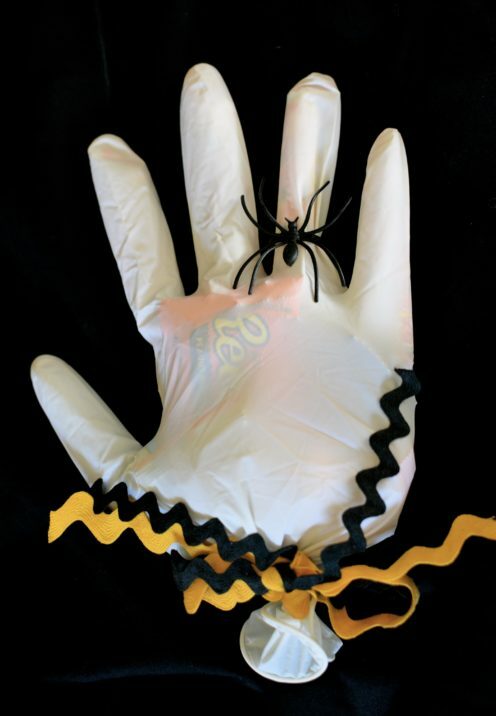 What will you “HAND” out on Halloween? All opinions expressed in this post are my own. All photos are the original property of Celia Becker @ www.AfterOrangeCounty.com and may not be reproduced without specific permission. This post contains affiliate links that help to make this blog possible.